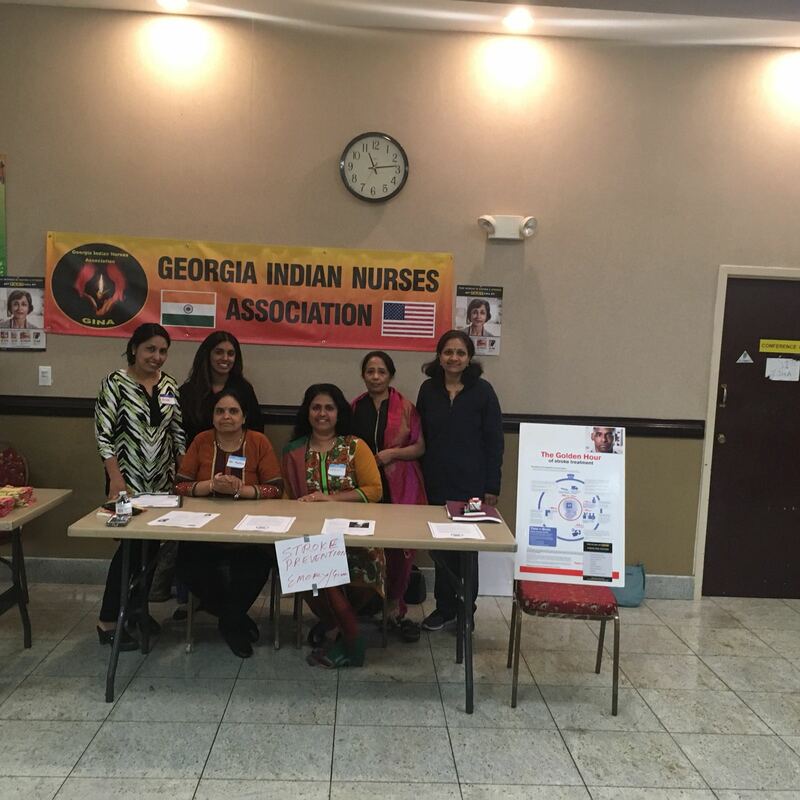 Atlanta, GA: SAI Health Fair, in coordination with Georgia Indian Nurses Association (GINA), hosted the 39th SAI Health Fair at the Hindu Temple of Atlanta, Riverdale, on Saturday, April 21. The Health Fair elicited a good response with attendance of over 300 participants. The Health Fair was organized by Dr. Sujatha Reddy as a tribute to the life and legacy of Mahatma Gandhi and also to promote his and Dr. Martin Luther King’s philosophies of non-violence, community service and social justice. 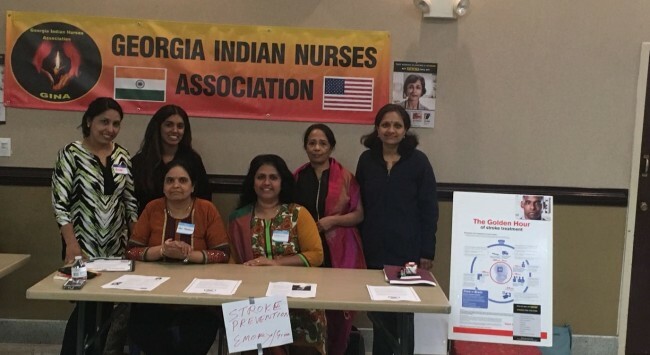 It was also strongly supported by health care professionals, nurses, doctors, Sangisetty Charitable Organization and Buffalows Fire Pump Inc., Baxley, Georgia. Over 150 cost –effective, basic quality comprehensive chemistry profile of blood tests with HBA1c were carried out at a nominal fee of $30 per test. The lab work was provided by Sy med LLC, in Tucker. It is noteworthy that the results of the blood work were mailed within a week with instructions to be followed at the free clinics as mentioned in the covered letter. The test results helped identify some life threatening results which were immediately notified to the participants. Over 90 EKGs were carried out by Emory Southern Heart Specialists and Gwinnett Heart Specialists, respectively. And over 25 audio screenings were done by Dr. Sridhar Krishnamurthy, Auburn University, Alabama. Peripheral Bone Mineral Density screening tests were in big demand. More than 34 bone-density tests were performed by a team of Madhu Reddy. Twenty-four were abnormal. These bone density tests helped the participants about awareness of osteopenia and osteoporosis. Susan G.Komen gave out informational material and advice on breast cancer awareness and mammograms. Stroke Risk Factor education was provided by GINA President Vidya Kanagaraj. Stroke is a leading cause of death in the U.S. Also called a brain attack, a stroke occurs when a clot blocks the blood supply to the brain or when a blood vessel in the brain bursts. Time is critical in preventing long term damage so the patient must be taken to the hospital immediately. Free consultations were provided by dedicated, committed and widely respected medical specialists in internal medicine: Dr.Hymavati Mikkilineni, Dr. Nimish Trivedi, Dr. Shyla Reddy, Dr.Vijayalakshmi Vaddireddy, Dr.Shylaja Prabhakaran; Cardiologists: Dr.Raja Reddy and Dr. Devendra Koganti; Endoctinologist Dr.Sravanthi Sanivarapu; Dermatologist Dr.Tulasi Vanapalli; E.N.T. : Dr.Shrinath Nadig and Dr.Trushna Rao; OB Gynecology: Dr. Sowmya Reddy, Opthalmology: Dr. Arati Pandya; Orthopedics: Dr.G.Natarajan and Dr.Sarvesh Naidu; Gastroenterology: Dr.Kavitha Gopal; Dentistry: Dr.Supriti Balyan and Dr.Swati kallipalli , psychiatry: Dr.Rohini Reddy;and audiology: Dr. Krishnamurthy, who all interacted with patients through free consultations. ENT Surgeon Dr.Trushna Rao Nadig enthusiastically conducted yoga sessions for the visitors. Dr.Ganesan, a Health Scientist at Center for Disease Control and Prevention gave out informative material on healthcare related issues and concerns in different languages like Hindi, Gujarati, English, to the patients. Advice on nutrition was given by Raquel Merced. Snacks, fruits and drinks were provided to all the participants by Sandra juric. Sai Health Fair provided for lunch to all the doctors, nurses, technicians and volunteers. Publicity coverage was carried by Khabar magazine, India Tribune, NRI Pulse, Telugu Patrika , Wownow , Rastradarpan, Desi-Express and Atlanta Dunia . 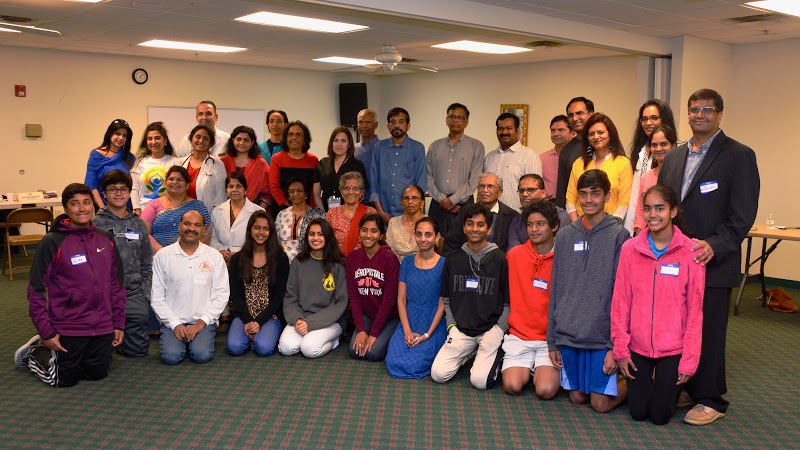 Mahadev Desai, Vasanthi Mahadevan and Ravi Ponangi helped with the media coverage and digital photography. 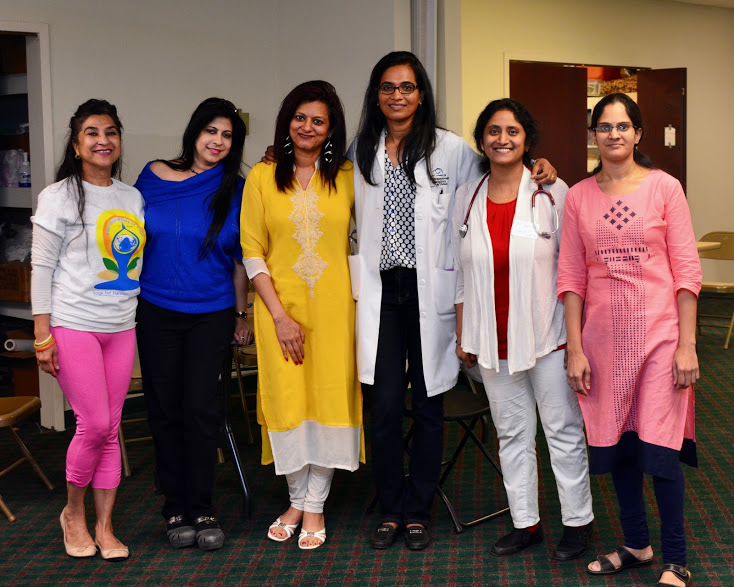 Dr. Sujatha Reddy effusively thanked GINA, all the doctors, nurses, technicians, and volunteers for their tireless efforts, for making the Health Fair event a grand success. “I’m glad to see so many people, from all walks of life, come to avail the opportunity to get free screenings & consultations with medical specialists. We have been hosting Health Fairs for a long time in different venues and they have been successful every time.